What Can I Add to Clorox When Mopping the Floor? Clorox is a chlorine beach used to disinfect clothing and household surfaces. You can use Clorox to mop tile floors and some hardwood floors--check manufacturer's labels to make sure the Clorox won't dull or damage the finish to the floor. When mixing or diluting Clorox, be careful about using chemicals that can cause noxious fumes. The safest thing to mix Clorox with is water. When mopping a floor, you can use 3/4 cup of Clorox to each gallon of water. This maintains a high level of cleaning properties without being too harsh on floor finishes. If you are concerned with how the cleaning solution will affect your floor finish, dilute this even further to make a mild chlorine bleach solution. Your mom may recommend mixing Pine Sol with Clorox. The reason is that while Clorox is an effective disinfectant, it is a lousy cleaning agent. Pine Sol is an oil-based cleaner that is a good cleaner but not a great disinfectant. By mixing the two, you are able to get the best of both worlds without having to mop twice. While there is no advocate group or research showing that water-soluble cleaners are safe, there is a lot of anecdotal claims that is practice is common and safe. The Clorox company suggests the only safe thing to mix with Clorox chlorine bleach is water. Other cleaners or compounds that can cause a chemical reaction can result in toxic fumes released from the Clorox, namely chlorine gas. This gas was a chemical warfare agent in World War II. Ammonia is the most notorious compound. Mixing the two can be fatal. 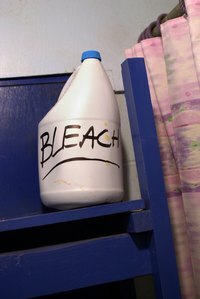 You should never mix Clorox, or any other chlorine bleach, with an ammonia-based product. Can You Use Diluted Clorox Water to Clean Ceramic Floor Tile?